Only one teaser trailer has given us a glimpse at the time traveling core of Men in Black 3 that has Will Smith as Agent J dealing with both and old Agent K (Tommy Lee Jones) and a young version from the 60's (Josh Brolin). The first two teaser posters for the summer blockbuster sequel didn't show us Brolin, but now he's featured on one of the new posters which IMP Awards has revealed. Both feature Smith as Agent J with both versions of Agent K. And the good news coming with these posters is that we'll be seeing a lot more of the Men in Black soon enough as a new trailer will arrive on Monday, March 5th, next week. 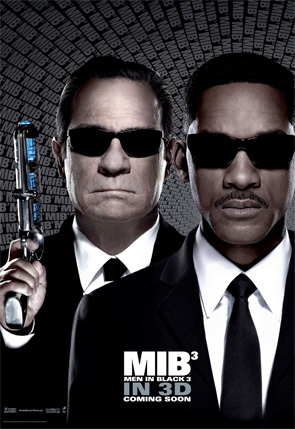 Men in Black 3 is once again directed by Barry Sonnenfeld, also of the first two. This newest sequel is said to be set mostly in the year 1969 and involves Agent J (Will Smith) time-traveling back to that year, where he meets up with a young Agent K (Josh Brolin) for some plot involving, most likely, our landing on the Moon. The cast also includes Emma Thompson as Agent Oh, Alice Eve as a young Oh, Bill Hader, Jemaine Clement, Rip Torn and Michael Stuhlbarg. It was shot in 3D and Columbia currently has it scheduled to hit theaters starting on May 25th this summer, so we'll keep you updated from here. Getting pumped yet? Regardless of anything, I will probably enjoy this movie. i thought the same. it's the forehead and the moustache. would you expect a poster to just pop out with a witty line? I was hoping for some inspiration, but all I see it's a crappy "copy/paste" from the MiB and MiBII posters. But, wait! This one will be 3D! Now I'm amazed. 😐 Look at his hand holding the gun. If he put his hand to his face, you'd notice how disproportionate it is..
TLJ could swallow his whole arm! I don't buy that arm. Fact check: it was not shot in 3D. I like the Alien³-like superscript ³ in the title. Then the Men in Black 3 below it for dummies. Then the 'In 3D' for maximum shitness.